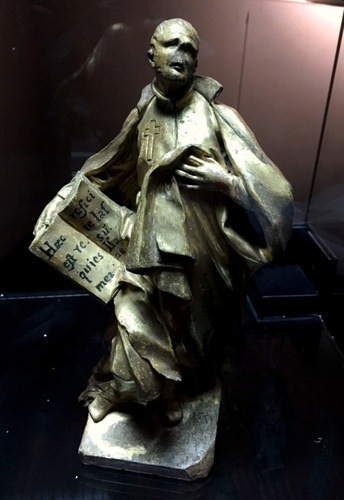 Saint Camillus de Lellis’ statue in the National Museum of Palazzo Venezia in Rome is a gilded terracotta scale model of the homonym statue situated in Basilica Vaticana, that dates back to 1737. In 1920 it became part of the collection of the National Museum of Castel Sant’Angelo as a work of Alessandro Algardi. Later in 1954, the scale model was attribuited to Giuseppe Rusconi because of its similarity with other Rusconi’s works . 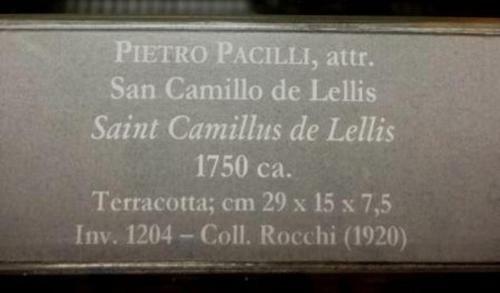 Only in 2002 Debenedetti, an italian art historian, attribuited this model to Pietro Pacilli as the first composition of the sculpture situated in San Pietro.